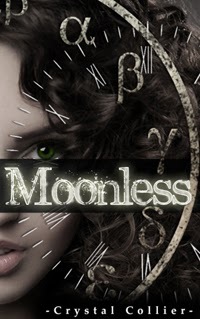 Author Heather McCorkle: Excerpt from Crystal Collier's Moonless & Giveaway! Excerpt from Crystal Collier's Moonless & Giveaway! It's time for a great book and a great giveaway! If you haven't heard of Crystal Collier's Moonless yet, then you are in for a treat. It is being described as Jane Eyre meets Supernatural and it seriously sounds that good! Today I'm excited to bring you an excerpt, and a giveaway from the author. Unravel the mystery of the Moonless night! Hidden in each of the 8 blog tour excerpts is a single word. Gather all 8 and figure out the sentence to win a free copy of Moonless. Send your mystery sentence to crystal (AT) crystal-collier.com with the subject MYSTERY SENTENCE before December 10, 2013, and you will be entered to win one of 10 copies of MOONLESS—just in time for Christmas. Happy hunting! Alexia lowered her eyelids to keep him from witnessing the forming tears. Kiren stepped nearer, tucked a hand up under her jaw, and pressed his lips to her brow. Warmth radiated from the connection. She accepted it, trying to be grateful for the simple reassurance that—despite his reluctance toward romance—he did care for and would protect her, even from himself. He sucked in a breath through his nose, and forced her chin upward. His lips crashed down over hers. Shockwaves rolled through her, her knees going limp. His arm slipped around her back, pressing her to him. His fingers tugged through her hair. She surrendered entirely to the cataclysmic torrent tearing through her body. The only things that existed were he, she, and the storm ripping through them. She clung to him. The only reality was this—this incredible connection. She wanted him, and nothing else. She wanted this, and nothing more. She wanted him, and he wanted her! He pushed her back, holding her arms against her sides. He grimaced, released her, and stepped into the shadows, vanishing. Congrats to Crystal! I'm so excited for her. For me? =) Thankee much! Wow! What a teamy excert that was! I am so excited at the prospect of winning a copy, I can't even tell you!!! Finally, getting to read excerpts, and such a good one this was, too! Can't wait to get a copy of this book...Christmas seems so far away, lol. LOL! I'm glad you enjoyed it, Michelle. They really do. So glad you enjoyed it. Thrilled for Crystal! And this is some seriously great stuff. I'm hosting her today! Wahoo! And it was amazing--your hosting, that is. "lips crashed into her".. what a great line.